There are so many Greeks all around the world. Living scattered like seeds diaspora all around this earth. In the United States around 3 million people have Greek heritage, in Canada at least 250,000, in Australia 380,000 and in the United Kingdom 300,000. Wherever Greeks go, Greeks seem to embody the saying "thrive where you are planted". Those of Greek heritage have distinguished themselves as community leaders, journalists, sportspeople, scientists, writers, artists, entertainers and in business and always as ambassadors of the Greek way of life. Centres of Greek life in the ελληνική διασπορά include Chicago, London, New York, Melbourne and Toronto. This site is for all diaspora Greeks, especially Cretans, to celebrate our heritage and the beautiful island of Crete. A visit to Halsted St in Chicago is to visit Greek Town so named back in the '20s when Greek immigrants came, fleeing the disaster of the hellenic holocaust. Chicago once had the highest population of Greek Americans. Today you can find authentic Greek pastries at the Pan Hellenic Pastry Shop and Artopolis on Halsted Street, and experience taverna atmosphere and Greek cooking at Pegasus, Roditys, Parthenon and Santorini restaurants, also on Halsted Street. Greeks in Chicago have come a long way since those first days. Today there are many organisation representing Hellenic culture and interests. 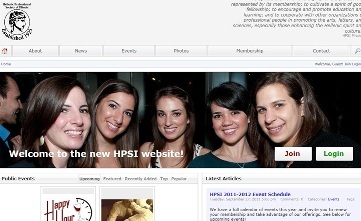 One of these is the Hellenic Professional Society of Illinois. 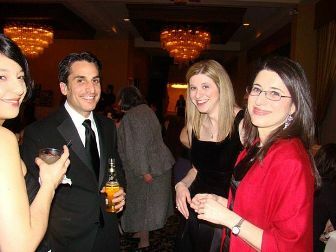 At a recent function, young professional Greeks attended (above). Today there are over 450,000 people of Greek ancestry living in Illinois. Greeks in New York are represented by Omonoia, the Cretan Association of New York, which was formed in 1918, after the suggestion and leadership of Mr. Stamati Kalamaridi since 1901. At that stage in history, Crete was not yet a part of Greece, and back home Venizelos was creating freedom for Cretans against the great powers after the conclusion of the Greco-Turkish war. 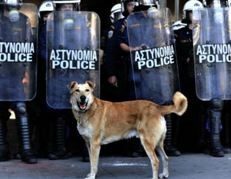 These were very early days in the modern history of Greece. To this day Cretans play a part in the life of New York. 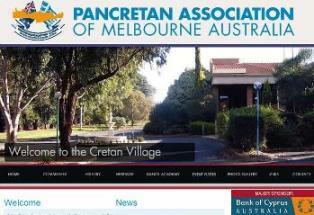 The Cretan Association has sponsored and created events for the community for many years. Highlights have been the raising of funds for fire relief, with a concert by beloved Cretan musician Mihalis Tzouganakis. Michael Psilakis is one of the most famous Greek chefs in New York, a Cretan with passion for the traditional flavours taught by his mother. His cuisine is both traditional and modern. His restaurants in NY include Fishtag, Kefi and MP Taverna, he has been honoured by many awards and cooked for the President at the White House. Titan Foods, a Greek deli supermarket at 25-56 31st Street in Astoria, Queens, New York. This store has a fine selection of Greek foods, 90% imported direct from Greece. This is the real deal in the heart of the Diaspora Greeks neighbourhood of New York. Get your feta, olives, olive oil, honey and pita bread here. 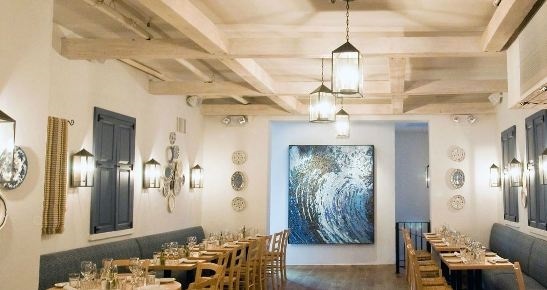 New York has many Greek Festivals annually in Astoria, Brooklyn, Rochester, St Nicholas Newburg and St Nicholas Staten Island, in Poughkeepsie, GreenLawn, Port Washington, the Catskills and in the Hamptons. Until recently, Melbourne in Australia was home to one of the largest populations of diaspora Greeks outside Europe. Melbourne had the third largest Greek-speaking population in the world after Athens and Thessaloniki. Thessaloniki and Melbourne are sister cities. Did you know that 47 per cent of Greek Australians live in Melbourne? About 380,000 people of Greek ancestry live in Australia. Melbourne is a famously cosmopolitan city. Those that found themselves uprooted and relocated to this grey, concrete city (with lovely parks) made up for it by establishing a Greek precinct which to this day adds a splash of the Mediterranean to parts of Lonsdale and Russell streets in central Melbourne. The block is filled with Greek culinary delights. Here you can find sweets like baklava, savoury mezedes for lunch or a late-night souvlaki. The famous Lonsdale Street Festival takes place in Melbourne in April and May each year at the corner of Lonsdale and Russell Streets; a party to celebrate all things Greek. The Greek Film Festival of Australia is held every year with screenings in each capital city. The Hellenic Australia Chamber of Commerce and Industry is home to many of Melbourne's stylish Greek gatherings such as the HACCI Excellence Gala Ball held every year. The HACCI Young Professionals Network brings young professionals aged between 20-35 of Hellenic heritage together to socialise, network and get involved in the community. Effie Stephanides - a good girl! 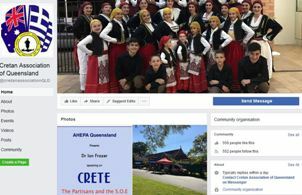 The Paniyiri Greek Festival in Brisbane, Queensland is one of the biggest cultural festivals in Australia, bringing thousands of visitors every year to Musgrave Park in inner Brisbane. This is the longest running Greek festival in Australia, started in 1976. Over 60,000 visitors enjoyed the most recent festival! 2018 - the dates are Sat 19 and Sun 20 May. If we are lucky, Effie - the alter ego of comedian Mary Coustas, will be there to entertain. "Too high, the hair? Too high? C'mon - tell me, is it too high?" Greektown in downtown Toronto is on Danforth Avenue, also known as Greektown on the Danforth, is one of the biggest Greek communities in North America full of cafes, shops, restaurants, boutiques and Hellenic experiences. Try Greek sweets at the traditional bakery, get your party needs sorted or hear some bouzouki music. Home to the Taste of the Danforth annual festival with cinema, arts, music, dancing, food, food and more food and wine, and olive oil and plenty of multicultural zingers for the tastebuds. 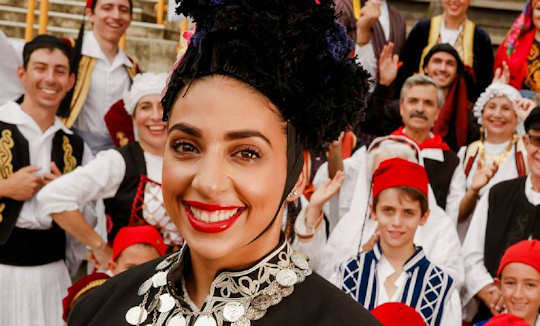 Diaspora Greeks all around the world have formed an number of associations representing every different island, region and walk of life, some of which are listed below.